The Associate of Applied Science Degree in Nursing prepares individuals to apply to take the National Council Licensing Exam for Registered Nurses (NCLEX-RN) following approval by the State Board of Nursing to become registered nurses and assume positions in the healthcare industry. Settings such as hospitals, long-term care facilities, and clinics are just a few of the career options available to Walters State nursing graduates. The Nursing degree program is offered at WSCC campuses in Morristown, Greeneville, and Sevierville. Successfully complete all required Learning Support courses prior to the selection process. BIOL 2010/2011 - Human Anatomy & Physiology I with lab (A grade of “C” or better must be achieved in all science courses. Biological science courses previously taken must have been completed within the last 10 years). ENG 1010 – English Composition I. MATH 1530 – Probability & Statistics. PSYC 1030 – General Psychology. Completion of computer competency requirement. Grade point average of at least 2.5 in required courses. *Students are encouraged to complete additional general education requirements prior to program admission. Students should seek advising to plan their academic schedule. The WSCC Nursing Program is accredited by the Accreditation Commission for Education in Nursing (ACEN). The Tennessee State Board of Nursing reviews and approves the nursing program annually. WSCC is a member of the Council on Collegiate Education for Nursing, an affiliate of the Southern Regional Education Board. You need to complete BIOL 2010/2011 (with a grade of “C” or better), ENGL 1010, MATH 1530, PSYC 1030, and all required learning support courses. You must also complete computer competency during first 30 hours of coursework and before applying to nursing. What courses do I need to get into nursing? 2) ENGL 1010, MATH 1530 and PSYC 1030. For career mobility, students will be ranked on classes completed through fall semester. Students applying for fall clinical admission will be ranked on classes completed at the end of spring semester. Students applying for spring clinical admission will be ranked on classes completed at the end of fall semester. When do I need to take BIOL 2020/2021 (Anatomy & Physiology II)? BIOL 2020/2021 must be completed before the beginning of the second semester of clinical nursing. When BIOL 2020/2021 is taken, a grade of "C" or better must by achieved for admission or progression in clinical nursing. Completion of BIOL 2020/2021 with a grade of "B" or better will be considered in your ranking score for admission. Do I need to take micro? Microbiology BIOL 2230/2231 must be completed before the beginning of the third semester of clinical nursing. When BIOL 2230/2231 is taken, a grade of "C" or better must by achieved for admission or progression in clinical nursing. Do I have to take Math? Yes, nursing majors must complete MATH 1530 prior to program admission. Do I need to complete the general education requirements before I apply to nursing? The required courses for admission consideration are BIOL 2010/2011, ENGL 1010, MATH 1530, PSYC 1030 and completion of computer competency. After completing these courses, you certainly are encouraged to begin taking the remaining required general education courses. ***Price of Professional Liability Insurance may vary based on additional licensure or certification. The Walters State Community College Department of Nursing shares the Vision and Mission of the College and supports the Campus Compact. The philosophy of the nursing program provides the foundation for the curriculum, reflects the beliefs of the faculty, and supports achievement of division student learning outcomes. Complete successfully the National Council Licensing Exam for Registered Nurses (NCLEX-RN). Provide safe and effective care for diverse populations. Promote improvement in the quality of life for East Tennessee residents. Maintain a spirit of inquiry through lifelong learning. Performance on Licensure Exam: The annual NCLEX-RN pass rate for first time takers will meet accreditation and state requirements. Program Completion: Sixty percent (60%) of students will complete the program within one hundred-fifty percent (150%) of the program length. Job Placement Rates: Eighty-five percent (85%) will be employed within six to twelve months post-graduation. The Associate Degree Nurse is prepared for entry level practice as a registered nurse. To achieve the outcomes of the program, graduates will demonstrate relationship-centered care based on national standards set forth by the National League for Nursing (NLN, 2010) and the Quality and Safety Education for Nurses initiative (QSEN, 2011). Practice within the ethical, legal and regulatory frameworks of nursing & the standards of professional nursing practice. Communicate effectively using verbal, nonverbal, and written techniques including information and technology. Analyze subjective and objective data to identify actual or potential health alterations. Evaluate outcomes of clinical decisions implemented to provide safe and effective evidenced-based nursing care. Evaluate the effectiveness of caring interventions that incorporate principles of dignity, diversity, safety, & knowledge. Incorporate principles of teaching and learning to meet the educational needs of patients, families, and /or groups. Collaborate when planning, implementing, and evaluating care. Manage care through effective use of prioritization, delegation, informatics, and resources. Inherent in the program and graduate outcomes are the core components and competencies basic to the practice of nursing as identified by the National League for Nursing (2000) and the quality and safety competencies identified by QSEN. The Walters State Community College nursing program promotes excellence in the teaching and preparation of students for life-long learning. Each student is valued as a unique person and is guided toward development of individual potential as a contributing member of the nursing profession and as a citizen in a democratic society. Meaningful, when there are goals and objectives. Enhanced, when the climate is non-judgmental. Meaningful and lasting, when there is opportunity for application. Enhanced, when the learner is motivated by an awareness of his or her own needs. Progressive from the familiar to the new and from the simple to the complex. Enhanced, when the learner is involved in the learning process. To prepare an adaptable generalist, nursing education is best accomplished in an institution of higher learning through a curriculum which incorporates knowledge from a variety of disciplines. These disciplines include the natural sciences, social and behavioral sciences, humanities and mathematics as well as the incorporation of oral, written, and technological communication. The combination of general and nursing education courses provides learning experiences that prepare the student to function with intellectual and technical competence, utilizing critical thinking skills in the application of the nursing process. The nursing faculty endeavors to provide the guidance that will enable each individual to apply his or her potential in the field of nursing. The nursing faculty facilitates learning for the students while functioning as nursing experts, teachers, mentors, and nurturers. The philosophy of the Nursing Program is a belief system held by the faculty regarding person, environment, health, and nursing. These defining concepts are interrelated and exist in a dynamic relationship. PERSON is defined as a human being worthy of respect and dignity. Accepting Maslow's theory, each individual has a hierarchy of needs from physiologic to self-actualization. Each person makes decisions and choices based on knowledge, cultural background, experience, perceptions, values, and goals. Changes in the person occur throughout the lifespan. Each person interacts with and responds to changes in the internal and external environment. The concept of person may include individuals, families, communities, and groups. ENVIRONMENT refers to the total of all factors and processes, internal and external, continuously impacting on the person. HEALTH is a dynamic state of being resulting from the adaptation to the interaction of person and environment. Health is a subjective and individual perception existing on a continuum from optimal wellness through end of life. NURSING is an applied discipline of knowledge and skills based on research. Nursing functions are dependent, independent, and collaborative. The nurse interacts with the person in the environment to promote health. As a stakeholder in the community, nursing has a responsibility to provide fiscally sound, quality care that promotes health, prevents illness, restores health, and facilitates coping across the lifespan. Nursing occurs in a variety of settings. Nursing process is a systematic method that uses critical thinking to provide structure to nursing practice toward the achievement of positive outcomes. Through the use of nursing process, nurses diagnose and treat the person's response to actual and potential health problems. The practice of nursing includes provision for a safe effective care environment, measures to achieve physiological and psychosocial integrity, and promotion and maintenance of health. 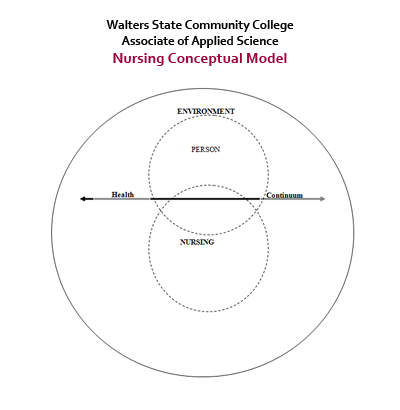 The Conceptual Model for this associate degree program depicts the interrelationship between the central concepts of person, environment, health, and nursing. The outer circle reflects the external environment. The broken lines of the two inner circles illustrate the continuous open interaction between the internal and external environments. The inner circles, representing person and nursing, overlap to depict the role of nursing as it interacts to promote health, prevent illness, restore health, and facilitate coping. The straight line intersecting person depicts the health continuum on which each person exists.